UPDATE!!! Enough signatures were collected. The following post is from the SCDAA & SCD Community in order for this bill to past there needs to be 93,006 signatures by October 22, 2014. We need you to act fast, many more signatures are needed. 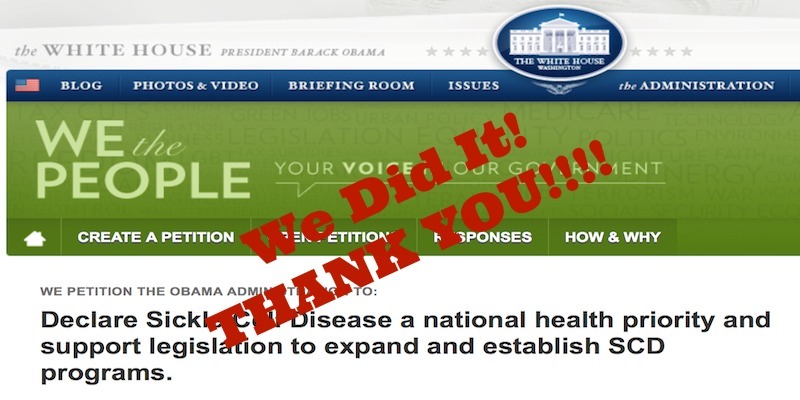 Declare Sickle Cell Disease a national health priority and support legislation to expand and establish SCD programs. Sickle Cell Disease (SCD) is Real! SCD is a major public health concern causing critical healthcare impacts in the nation. Reauthorization of the Sickle Cell Treatment Act – Bill H.R. 5124 will expand the national newborn screening program, develop a comprehensive adult transition program, continue public surveillance, expand research efforts and establish up to 25 sickle cell treatment centers throughout the US all in an effort to support the creation of a sustainable comprehensive model of care for individuals affected by SCD. We request acknowledgement and declaration of SCD as a national health priority; support of legislative Bill-H.R. 5124 and return funding for SCD programs in the President’s budget.